Colorado quarterback Steven Montez (12) throws a pass during the first half of Saturday’s game against Nebraska in Lincoln, Neb. LINCOLN, Neb. – Steven Montez couldn’t bear to watch. 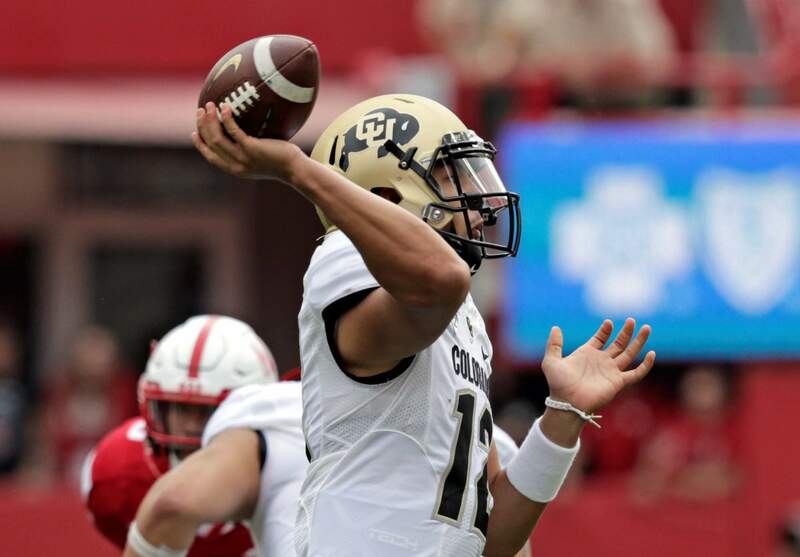 Colorado’s quarterback had just connected with Laviska Shenault Jr. for the go-ahead touchdown, and now Nebraska backup Andrew Bunch had the Cornhuskers at the CU 20 in the final minute. Montez might have been the only person in Memorial Stadium who missed seeing Bunch’s last pass sail over JD Spielman in the back corner of the end zone, allowing the Buffaloes to win 33-28 on Saturday and spoil Scott Frost’s debut as the Huskers’ coach. There was no lack of drama in the teams’ first meeting since 2010, the last season in the Big 12 for both. Though they went their separate ways after some 60 years as conference mates — the Huskers to the Big Ten and the Buffs to the Pac-12 — this game had the look and feel of some of the classics from yesteryear. Nebraska (0-1) lost fumbles on its first two possessions and spotted the Buffs a 14-0 lead. Adrian Martinez, the first Nebraska true freshman to start an opener at quarterback, scored the second of his two touchdowns to put the Huskers up 21-14 late in the first half. His 57-yard pass to Spielman made it 28-20 in the third. CU (2-0) wrested momentum at that point. Montez’s 8-yard pass to Jay MacIntyre made it a one-point game, and the Buffs missed two chances to take the lead when James Stefanou was wide right and left with two field-goal tries. But Nebraska couldn’t put the Buffs away, failing to convert a fourth-and-1 and Martinez throwing an interception before Montez got his last chance. Colorado (2-0) got the ball for the last time with 2:23 left after Martinez went out of the game because of an injury. Montez moved the Buffaloes from their 23 to the Nebraska 41 before Ben Stille sacked him to set up a third-and-19 that became third and 24 after a false start. Montez overthrew Jay MacIntyre over the middle, but safety Antonio Reed was called for a personal foul for hitting the defenseless receiver. Given new life, Montez hit Shenault along the right sideline for 40 yards and the go-ahead score with 1:06 to play. The Huskers (0-1) were playing their opener a week late. Last week’s game against Akron was cancelled right after the opening kickoff because of inclement weather. “Beating Nebraska is great, but it doesn’t taste nearly as good as a Pac-12 championship,” Montez said. THE TAKEAWAYColorado: Montez continues to stamp himself as one of the premier quarterbacks in the Pac-12, making play after play on a day when the running game couldn’t gain traction. UP NEXTColorado plays at home against FCS opponent New Hampshire.